Before leaving the leaders of the church in Ephesus for the last time, Paul wrote, “…after my departure savage wolves will come in among you, not sparing the flock. Also from among yourselves men will rise up, speaking perverse things, to draw away disciples after themselves. Therefore watch…” (Acts 20:29-32 NKJV). For more than a decade, BFL has ‘watched’ and sought to address challenges that come with rapid growth. One of such challenges is the deficient knowledge of and faulty application of the teachings of the Bible. 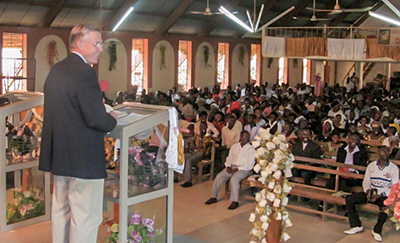 The thrilling proliferation of churches in Africa is one of the most hopeful signs of our times for world evangelization. Yet these growing churches and their leaders remain desperate for training that will equip them to reap the largest possible harvest and become a mission force to unreached peoples. If the local church is God’s instrument for transformation, then pastors are the key in helping churches fulfill this vision. 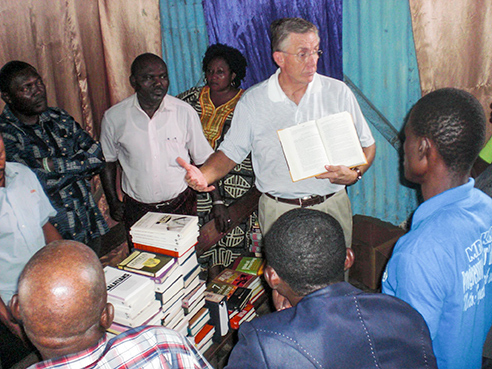 Sadly, Pastors are the most neglected ‘professionals’ in most third world nations. While the African church is a mile long in terms of quantity, it is only an inch deep in terms of quality. In our search for ways to address this problem we at Bread for Life have been blessed with a great partnership with Westside Chapel of Jacksonville, FL, and their senior pastor (Dr. Kenneth Mitchell). Each year we provide training to over 400 pastors and church leaders across our region. These conferences are unique as they focus on expository teaching and preaching. Our hope is that leaders who go through this training will acquire skills to use in interpreting scriptures to their congregations in familiar language, using colloquial metaphors, African thought-form and nuances and practical applications that fit their context. The fact is, sound scriptural teaching will produce sound communities. While we are not polemicists who believe their task is to combat every false teaching, we must be passionate about preserving the integrity of the gospel of Jesus Christ, else we will see a repeat of some of scandals that date back to the Thyatiran church (Rev., scandals that are becoming prevalent in some quarters, today). Sadly, a vast majority of these scandals come about because of unbalanced teaching and personality cults. Teachings that promoted self and breed greed and avarice. These sorts of teachings and lifestyles are in the increase in the African church and leadership today and are affecting the holistic growth of the church at large. Interestingly, the government of Cameroon recently closed quite a number of churches that it believed were taking advantage of church members. While we do not believe it is the role of the government to address church or theological matters, it sends a message to all of us when the government begins to close churches not because of persecution, but because these churches are deemed by the government for being abusive! Like every other thing, there are costs associated with our Rightly Dividing the Word Conferences. We are always looking for folks or businesses to help us underwrite the costs which usually cover logistics, meals and materials. Would you join us in our efforts to build a better Africa, as together we are taking Jesus’ unchanging message to a rapidly changing continent through words and practical deeds?